Are you living with a Sense of Urgency? Welcome to week 26 of our Core Conditioning Program Accountability Challenge. It’s hard to believe that it’s been six months since we embarked on our challenge together. I hope you have been enjoying the process and that you remain committed to achieving the goals that you identified as being most important to you. If you are finding that yourprogress is slower than you desire, then I have an idea that I think might get you moving in the right direction. It’s as simple and as challenging as creating a compelling sense of urgency. What does creating a sense of urgency mean to you? To me it means having a reason or set of reasons that are strong enough to overcome all of the forms of Resistance that will naturally attempt to hold us back. I was having coffee with a friend of mine recently and he shared a story that served as the inspiration for this week’s message. He asked me if I had ever heard of the Burning Platform story. I replied that I hadn’t. He shared the riveting story of a worker on an oil rig somewhere along the English coast of the North Atlantic. He awoke one morning to find the oil rig engulfed in flames and black smoke. The platform that he was standing on was burning. He quickly assessed his situation which had dramatically gone from desperate to disastrous. Here he was, perched precariously 120 feet above the frigid waters of the Atlantic –he could choose to jump which would most likely result in an outcome featuring drowning, grave injury and probable death or he could choose to do nothing and wait for the inevitable. He chose to jump. Miraculously, he survived the 120 foot plunge into the icy waters, while the rest of his crew perished aboard the rig. He was asked what possessed him to make the decision to jump. He replied that although jumping from a height of well over 100 feet would likely result in his probable death, staying where he was guaranteed him certain death. Faced with these two options and an obvious sense of urgency he chose the path that at least gave him a chance at survival. Can you imagine the progress that you will make toward your goals in life if you choose to live with a similar sense of urgency? Take a moment to pull up a mental picture of your highest priority goal. Do you have it clear in your mind? Has the picture gotten a little fuzzy, or blurry? If it has now is the perfect time to Clarify Your Target. One of the most effective and impactful exercises that we can engage in on a regular basis is to devote 10-15 minutes per day to take a mental snapshot of our most important goal. It’s ok if your picture starts out as a vague idea, not completely finished or clear in your mind. Progressively chip away at the picture of your goal as if it were a masterpiece Michelangelo sculpture hidden beneath a slab of beautiful marble. Keep chipping until you can clearly see the sketch of your goal formed into a detailed, fully developed, spectacularly clear vision. Repeating this exercise on a daily, consistent basis will help to create a sense of clarity, power and momentum and don’t be surprised if your desire will begin to magically and majestically take shape just as the statue of David uncovered by the expert hands of the sculptor. 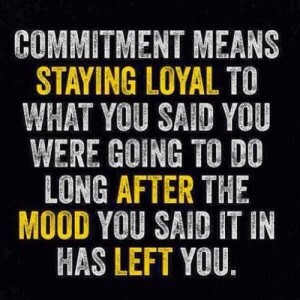 What do you do when your commitment to your goals just doesn’t seem to be there? If you have a BIG goal, one that stretches the boundaries of your comfort zone-then it is only normal that you are going to have those moments, or days where your commitment to completion is tested. That old internal enemy that I refer to as Resistance, has a way of creeping up on us and dispensing any number of rationalizations (or “rational lies”) as to why we should “back off just a little” from the important goal (s) that we have set for ourselves. I know this to be true because it has happened to me on a number of occasions. The interesting thing about rationalizations is that they are filled with bits of truth-but they are also insidious dream stealers that are driven by one singular purpose-that purpose is to stop us from doing the work that our goal is asking us to do to achieve it. There is a powerful reason, or number of reasons that inspired us to set our goals in the first place. Setting big goals is relatively easy, achieving them is another story. So when you do experience these moments of self-doubt, self-sabotage, or self-defeat, the antidote is to look back at the powerful, positive, passionate reasons that inspired you to set the goal in the first place. Do these reasons still exist? 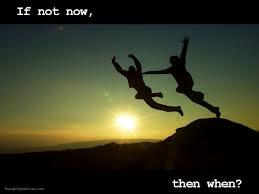 If the answer is yes, and I know that it is, then NOW is the time to make a new Commitment to Completion. Commit to doing the work that your goal is asking you to do. Commit to doing the work today. Don’t worry about tomorrow; just focus your attention on today. What is the work that my goal is asking me to do TODAY to accomplish it? For me it’s going down to the basement and getting on my indoor bike trainer and completing my workout when I really don’t feel like doing it. It’s saying “no” to that old sly enemy known as Resistance, just for today. It’s about a commitment to completion that I’ve made to myself. What is the work that your goal is asking you to do? 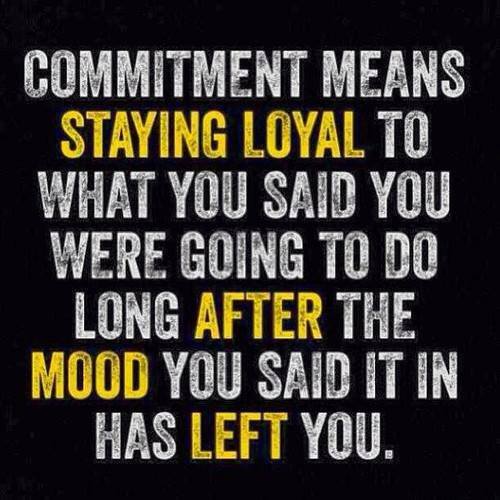 Commit to doing the work, just for today! Quite often the determining factor in the success or failure of the achievement of the goals that we set in our lives boils down to our belief in whether we can pull them off. It’s time for one of those moments of complete self-honesty. Do you believe you can achieve the goals that you have set for yourself? If your answer is “Yes”, then you have probably already made terrific progress on the path towards your goals. If however your answer is “no”, or “I’m not sure” then chances are you may be experiencing some significant challenges to reaching your goals. The good news is that we have complete control over our thoughts and beliefs and that we have the power within us right now to take corrective action and to strengthen our belief systems and achieve the goals that we set for ourselves. I have adapted this week’s challenge from the fore-mentioned book The Magic of Thinking Big. The book came into print back in 1959, but the principles are as true today as they were then. 1. Think success, not failure. Spend five minutes per day this week mentally focusing on what you want in your life, as opposed to what you don’t want. This may appear to be self-evident, however the truth is most people focus on what they don’t want; poverty, mediocrity, being overweight or out of shape, and guess what it is they end up attracting? 2. Remind yourself regularly that you are better than you think you are. Take a few minutes to write out or review your list of victories. You can go back to week 3 of our challenge to review and revisit your list of the ten year victories if you like. 3. Believe Big: The size of your success is determined by the size of your belief. Think little goals and expect little achievement. Think big goals and win big success. Perhaps you are not dreaming big enough. If your current goals don’t scare you a little (or a lot) than there is a very good chance that you are not dreaming big enough. Spend a few minutes this week to DREAM BIG. I will leave you with Brian Tracey’s wonderfully thought provoking and inspiring question. What would you dare to dream if you knew you could not fail? Dream it, and then go do it! 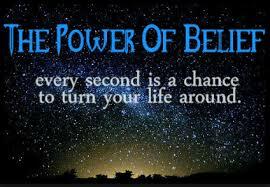 Thought for the week :The size of your success is determined by the size of your belief” Davd Schwartz.